Have you noticed that some apps will appear automatically in the iPad Dock with a little tiny alarm clock icon on them? 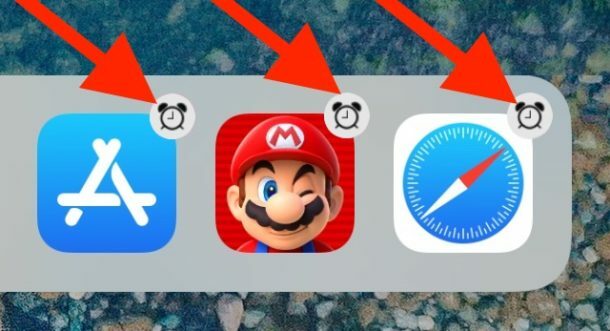 You may be wondering why those app icons with the alarm clock badge appear in the right side of iPad Dock at random and what their purpose is, and perhaps you’re even wondering how to get rid of them and remove those alarm clock badged icons from the iPad Dock. If you assumed apps showing an alarm clock badge on them had something to do with the Clock app that would be a fair guess, but it’s wrong, so don’t bother opening the iPad Clock app and poking around in there. Instead, the reason why apps with a tiny alarm clock icon badge appear on them in the iPad Dock is due to a relatively new machine learning feature, where iOS and Siri aims to recommend apps to use based on the time of day. For example, if you have frequently used Safari on the iPad at or near 8pm in the evenings, then Siri will start to recommend and suggest the Safari app by placing it into the right side of iPad Dock at around 8pm. This same learning process happens with all other apps too, and the iPad Dock will continue to recommend and suggest other apps for using for times of day depending on how you use the device. Some people may like this feature for suggesting apps based on time of day, but other iPad users may not and want to get rid of the the iPad dock icons with the alarm clock badge on them. There are a series of steps you can take to remove those clock badged icons from the iPad Dock. Note if you disabled the Recent and Suggested Apps on iPad Dock early in your iPad ownership history, then you likely have never seen the clock badge appearing on iPad Dock apps. To effectively remove the apps with the alarm clock icon badge from the right side of the iPad Dock, you will disable a few features on iPad Settings and then juggle the iPad app with that clock badge in and out of the Dock itself. Whether or not you like this feature is entirely up to you and your personal preferences and how you use an iPad. If you’re inclined to prefer direct control over what apps appear in the iPad Dock, then remember you can add more apps to iPad Dock (up to 15) manually, which combined with disabling the suggested apps features should offer you precise control over what apps appear in the Dock. If you have never seen these apps but you like the idea of iOS and Siri recommending apps to you based on the time of day, reversing the settings changed mentioned above to show Recent and Suggested apps will eventually begin to show these time-specific recommended apps in the iPad Dock. Finally, there are a few other type of recommended and suggested iPad Dock apps that will appear automatically. Another type of badged app icon that appears in iPad Dock is something with Handoff, which shows a little screen icon badge on the app, and that indicates the app can be ‘handed off’ to or from another iOS device or Mac that is nearby with the same Apple ID. Additionally, you may see a badged app icon appear in the iPad Dock randomly that shows a little arrow icon on it, and that indicates an app recommendation based on the physical location of the iPad and usage based on a particular location (for example if you use the Maps app every time you are at a specific place, that icon with the arrow may appear in iPad Dock automatically). Simply disabling the suggested and recommended apps should remove those app recommendations as well. IF you have any other solutions, thoughts, recommendations, tips, tricks, or other helpful knowledge about the suggested iPad Dock apps with the various badges appearing on those app icons, share with us in the comments below! This worked! I already had everything turned off in Settings when I got the alarm clock badge, but your simple instruction to remove the Recommended Apps from the Today list did the trick! Thank you! I am so tired of all the “stuff” apple keeps throwing my direction. Between killing apps and other things. They have reached the straw count and the camel has had it. That said this is the last apple thing I may own or use. It should be a matter of User Choice, a choice that has to be opted into rather than a ‘dictate’ that then has to be manually altered at the time and expense of the User. The prime aspect involved is Users ‘pay’ for the privilege of using the Software, in the case of Apple the funds are extracted by the costs of the Hardware needed to run it. This is tantamount to abuse of Users. The time spent on this type of coding would be better spent on resolving existing irritations in the Apple System. E.g., Watch 4 Calendar reluctant to follow the system option chosen for ‘Day to begin week’, or the inability to set all Units to those of User choice. The latter including the inability of the User to change Wind Speed to Kilometres per hour rather than Miles per hour. Seems like the ‘Piper’ needs to remember who is paying for the ‘tune’? There’s a similar function when you plug headphones in, with headphones icon. Hey Paul, thanks for great tips again! The little screen icon that appears on some apps in the Dock indicates that “Handoff” can be used for that app. Essentially that feature lets you ‘hand off’ an app session and pass what you’re doing to another nearby iOS device, for example you’re watching YouTube on an iPhone but you see the little screen icon on the YouTube video on an iPad, you can tap it on the iPad to resume watching the YouTube video originally from the iPhone now on the iPad. The recommended procedure does not work for me. I carefully followed the recommended procedure, not once, but twice. Are there any other methods to rid an icon’s alarm clock? NONE of the procedures in the article worked for me, either!! The noted Settings were ALL already OFF! I have NEVER seen a “minus” sign on any icon- EVER! Just the X. Moved the Chrome icon with clock, into the main Dock area. If I held, then tapped the “X” (again, no minus badge) I’m offered the usual option to DELETE Chrome!!? as is the norm. Everything Apple is so convoluted!! Developers,… take a vacation, please!